Situated on or a short drive from the Norfolk Coast, we have a selection of five properties in which to stay. Contemporary homes on a peaceful seaside park, a 16th century flint cottage, a Victorian cottage in a seaside town or apartments in the Norfolk Broads. In Norfolk you'll find miles of sandy beaches, woodland walks, and dog friendly eating places are all around. Norfolk is truly a dogs welcome place. Contact Debbie for more information. We've recently had 5 days at Church Cottage at Catfield in a grade ll listed thatched cottage to die for. We were 3 adults a baby and our dog and found that it met all our needs plus some. The décor was fabulous and so very very comfy. we loved the Kitchen and living room spending most of our time chilling out on the big squishy sofas or at the farm house table in the kitchen. The Kitchen had everything we needed and everywhere was tastefully furnished. Our dog loved the cottage garden with all its nooks and crannies, a massive area for her to explore. There were walks from the door which were at the back of the church opposite and just 15 minutes drive to dog friendly beaches and minutes away from great dog friendly pubs with fab food. Very clean and well -appointed, lots of small touches which were appreciated. Both my dog and I enjoyed the lovely, dog-friendly walks even though the weather wasn't always friendly! Hope to return for another short break sometime. Small but comfortable cottage ideal for a couple with two dogs in a lovely little village with great beach walks within walking distance and many more within short car trips. Ideal location for either beach or broads. This was the return after many years to bacton. We wanted a holiday with our dogs. 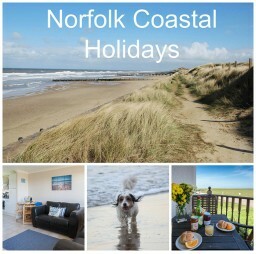 And chose tides Norfolk coastal holidays. It was a very good choose. The first and to me most important was the helpfulness and accommodating owner Debbie. Who made you feel welcome and not strange because we wanted our pets with us. In fact made them welcome. Her property is first class. And a lovely location. Leading on to stunning beaches. I have lived a long while in Spain. And still couldn't fault Norfolk beaches. The bungalow has everything in it you could want. A nice selection of doggy treats which were much appreciated. THANKYOU Debbie for having these lovely places for us to visit. I will definitely be a frequent visitor and have recommended it to all my friends. Which to my delight have booked .? First time in Norfolk and what a fabulous place to stay. Tides chalet at Bacton was fabulous, all modcons and beautifully clean. Information of the area was left in detail in the chalet for everybody to see. Nice touch even a packet of doggy biscuits for our dog. Would certainly recommend to all our friends. Another lovely week spent at this lovely holiday home. It really is the most relaxing place to go. The facilities are clean and beautiful and the beach is on the doorstep and you may as well call it a private beach!! If you are looking for the perfect place to go with your 4 legged friend then this is the place..... your pooch is treated just as well as you, with their own doggy biscuits. This was the first time here with my new furbaby. It was quite an emotional holiday as I've been here with my last boy for the past few years, but Hugo loved it! We have had a lovely relaxing time at Tides, the chalet was clean with everything you needed, the beach 2 mins away - our dog loved all the walks and the sea! Also local cafes, Chinese and fish and chips, we will definitely visit again and have already booked for September! We rented Tides Cottage for a weekend and loved it. It was clean, well presented, comfortable and loved the personal touches such as the homemade dog biscuits, and Charlie the cuddly dog and his diary to write his adventures in. Was great being 2 minute walk from the beach and we loved discovering Sherington park, the boat trips to see the seals and a day at Great yarmoth. Would definitely come back and will be recommending it to others. Bramble Cottage was the first cottage we had taken our rescue Husky, Marley to and he loved it. The garden was fully enclosed and provided shade and sunshine on a summers day. Inside, the floors were all stone, so easy to keep clean after walking on the beach and the living area was spacious enough for Marley to sprawl! It was a 10-15 minute stroll across the neighbouring field to get to the dog friendly, long, sandy beach. Along the cliff top it was a 1.5 hour round tip to the Lifeboat station at Cart Gap and back along the beach. In the other direction it was a 2 hour round trip to Walcott along the cliff path. Hill House pub in the village is very dog friendly, inside the bar and outside in the garden. The food is good too! We have now stayed at Beachscape and Tides twice, and Bramble Cottage once. We always have a fabulous time with our dog, a lovely place to relax, with easy to reach beaches. The chalets are always so well equipped, and we had a lovely treat left for us and the dog on our last stay at Tides. Can't fault anything, won't be long before another return visit. Have stayed at Tides twice now and love, love, love it! Comfortable and spotless dog friendly accommodation. Amazing location, fantastic for dog walks and getting away from it all. Have booked to stay in Bramble Cottage next year! Would totally recommend to all! Wonderful, well equipped and dog friendly. Have had the most relaxing week. The owner was very accommodating and we loved the doggy treats. So close to Bacton Beach we could walk dogs several times a day. Going back again next year. We stayed at Tides March 2017. Chalet is perfectly situated for long dog walks on the beach with a great pub enroute. Chalet is comfortable, clean and everything you could require...even down to homemade dog treats! We found Debbie really helpful and provided us with lots of useful local information. We thoroughly enjoyed our break at Tides, child and dog friendly. A real gem in Norfolk. We have stayed at Tides twice (New Year and Christmas) and we have booked to return this Christmas. A well maintained and equipped holiday home on a quiet park within a few minutes of the beach which is perfect for giving our Springer a great walk/run. Cafes nearby and a short drive takes you to the nearest town with all you need for a great self catering break. And the hand made dog biscuits always make Basil feel special. We're making our third trip this summer to Beachscape. We've found a real gem! Very dog friendly, excellent place for the kids to play safely whilst we relax. As soon as we unpack, the weight of the world disappears! Cannot wait to be back there. We stayed at Beachscape, Rainbows End in Bacton on four occasions over the last four years - our two dogs thought they were in heaven - beautiful safe beaches for them to run on - a chalet site which welcomed dogs - numerous countryside or beach walks to explore and a wonderful verandah for them and us to relax on - the accommodation was 5 star- it was such a magical place and experience that it prompted us to buy our own chalet there - thank you for introducing us, Tess and Cookie to this haven. Myself, husband and Bichon Frise visited in August 2016 with my parents and their dog. Then we decided to book again for this year in May. We stayed in Beachscape with my two Bichons this time. The chalet has everything you need for a peaceful relaxing holiday. The park is completely doggie friendly, and a stones throw from the glorious beach, where doggies can run free all year. Debbie leaves a lovely tea tray for your arrival which includes some very yummy doggie biscuits. The veranda is fenced with a lockable gate. My two doggies love sitting here watching the world go by. The whole area is very dog friendly, including pubs and cafes. We can highly recommend if you like to holiday with your doggie family. We stayed here for the second time - 4 nights at Easter. Just like the first time we absolutely loved it. The weather was kind to us, we visited Sherrington, Cromer, Great Yarmouth and spent a lot of time at the dog friendly pubs and beach just a very short walk away. You cannot go wrong here, everything on the doorstep. The cottage was immaculate and very well equipped. We loved every minute. We've stayed at Beachscape twice now and will be booking a third time too. It is very clean, tidy and well equipped. Hand made doggy biscuits were left for our dog on arrival. The double bed is very comfortable. Beautiful view sitting on the veranda. Lovely pub just a short walk along the beach. It is the most relaxing holiday we've ever had. Highly recommend. Totally dog friendly. We spent a fantastic few days at Tides a chalet property. The accommodation was a real home from home for our 4 dogs , my husband and myself. Situated just a few yards from the Cliffs and beach , the perfect spot for doggy walks or just playing on the beach. The property was outstandingly well equipped with some lovely personal touches (even homemade doggy biscuits left for our pooches arrival) . Thoroughly recommend a stay here. We had a lovely and quiet weekend in the Beachscape Chalet. A fabulous location right on the cliffs above the beach. 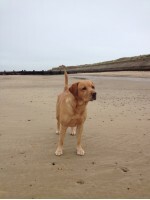 Most beaches are dog friendly and within a short walk of a brilliant pub. We have three dogs and all three loved sitting out on the verander watching the world go by and then going for walks along the beach, playing in the sea and sleeping on the rug back in the chalet. We spent a lovely relaxing long weekend in the Tides chalet. Wonderful location and accommodation enjoyed by all especially our Labrador who couldn't believe his luck. Home made doggie treats and several trips to the beach a day. Would highly recommend . We spent 4 nights at this charming chalet a in May 2015 and immediately booked another stay for May 2016. We went abroad in November 2015, and the dogs were boarded for the first time in their lives. On our return we decided that the dogs needed a holiday too, so we booked a break at Beachscape for January. We nor the dogs were disappointed. The property is totally dog friendly, right down to the secure decking where the could enjoy the wonderful fresh sea air. For us humans the usual 5* facilities afforded made for a relaxing and peaceful winter break. We all enjoyed the freedom that the lovely beach offered and the warmth we enjoyed in the chalet when we returned from our walks. We cannot recommend this property highly enough. We have been to Beachscape (& Tides) several times now and absolutely love it. They are clean, tidy and have everything you need for a dog holiday. With quiet Bacton beach right on the door step it is perfect for walks on the beach or along the sea wall. The gated deck is ideal for drying damp doggies whilst knowing they are safe, and for general people watching which my chocolate lab loves to do. The local pub Poachers Pocket is in walking distance, dog friendly & does great pub food. We are just planning next year's trip! Just spend our second holiday at Norfolk Coastal Holidays, we had two chalets this time, Beachscape and Tides so the family could come also. Its a lovely place to take your dogs(s) as the beach is dog friendly on that section at all times, and you can walk them on the lead all along the coastal pathway above the beach. I would highly recomend this hoilday, lovely views, shops nearby and a good fish and chip shop and the chinese restaurant do take aways. Tia our jack russell really enjoyed her holiday, we went to the Lighthouse Inn in Walcott and the Recruiting Sargent about 12miles away that are both dog friendly, good meals in both.